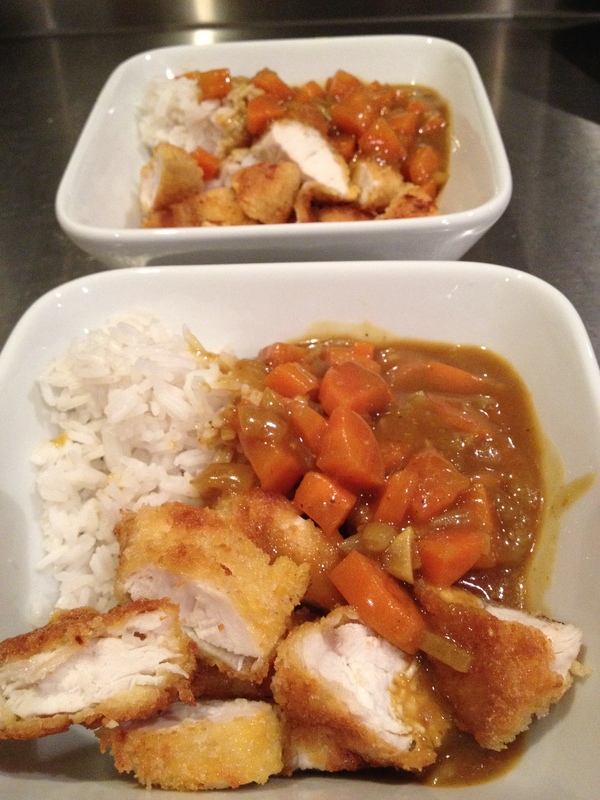 In our house we love a good katsu curry, or “Japanese KFC” as my husband calls it! I checked in with a friend of mine who is very knowledgeable on all things Japanese (interestingly he wrote his PHD thesis on the rise of amateur sumo wrestling around the world, but I digress….) as I was wondering if it was a Western invention ala chicken tikka masala and if it is eaten in Japan. He said it is indeed widely available and loved in Japan. According to Wikipedia, curry was first introduced into Japan during the Meiji era (1868-1912) by the British. Katsu curry or katsu-karē became popular and available to buy in supermarkets and order in restaurants in the 1960’s. Pork is largely used, but you can also make it with chicken as I have here, and beef. To make the sauce, heat the oil in a small pan. Add the onion and garlic and sauté for 2 minutes, then throw in the carrots and sweat slowly for 10 minutes with the lid on, giving the odd stir, until softened and starting to caramelise. Stir in the flour and curry powder and cook for a minute. Slowly pour in the stock until combined (do this gradually to avoid getting lumps). Add the honey, soy sauce and bay leaf and bring to the boil, then reduce the heat and simmer for 20 minutes, so the sauce thickens but is still of pouring consistency. Add the garam masala, then pass the sauce through a sieve (unless you prefer a chunky sauce). Now prepare the chicken. Lay the seasoned flour, egg and breadcrumbs on separate plates. Coat the chicken in the flour, then dip into the egg and finally into the breadcrumbs. Heat the oil in a frying pan and fry the breaded chicken breasts for 5 minutes on each side, or until golden and cooked through. Remove from the pan with a slotted spoon and leave to drain on kitchen paper. Slice the chicken diagonally and serve with the sauce drizzled over steamed rice.